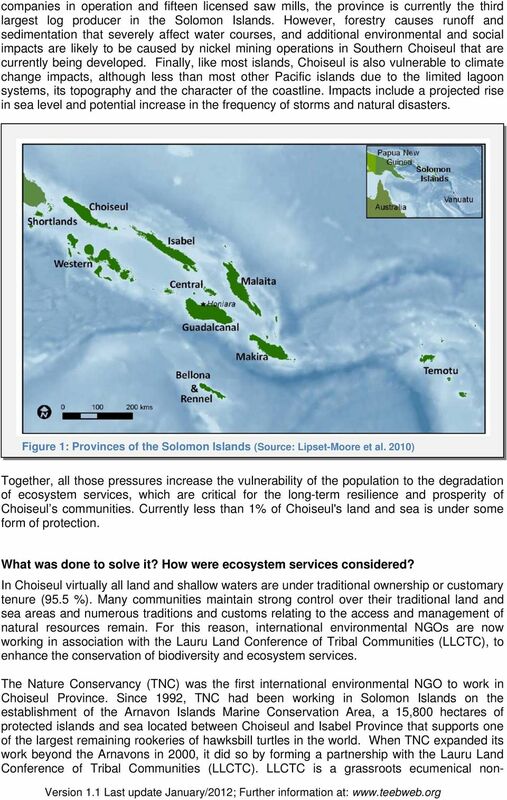 Download "Assessing ecosystem services for Lauru Protected Area Network (LPAN), Choiseul, Solomon Islands"
1 Assessing ecosystem services for Lauru Protected Area Network (LPAN), Choiseul, Solomon Islands Authors: Susi Menazza and Tasneem Balasinorwala (UNEP-TEEB) Short title: Ecosystem Services for protected area network planning, Solomon Islands Key Message: Analysing ecosystem services and environmental pressures is helping to optimise the location of a protected area network in Choiseul, Solomon Islands. 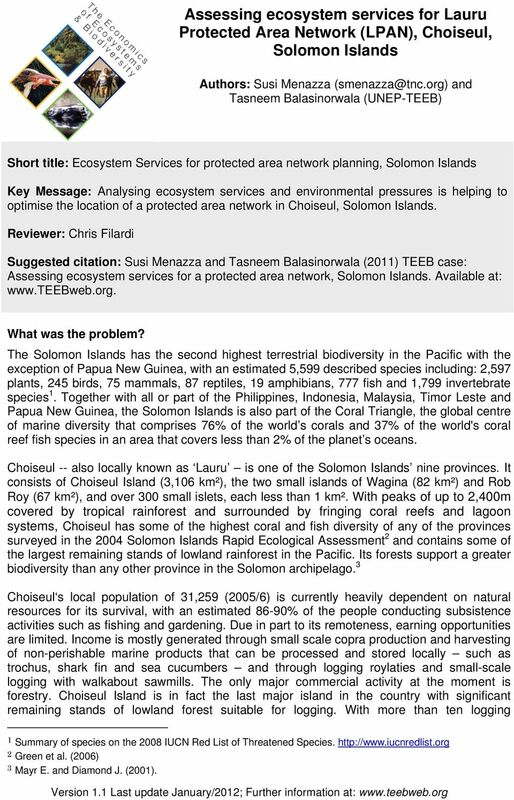 Reviewer: Chris Filardi Suggested citation: Susi Menazza and Tasneem Balasinorwala (2011) TEEB case: Assessing ecosystem services for a protected area network, Solomon Islands. Available at: What was the problem? The Solomon Islands has the second highest terrestrial biodiversity in the Pacific with the exception of Papua New Guinea, with an estimated 5,599 described species including: 2,597 plants, 245 birds, 75 mammals, 87 reptiles, 19 amphibians, 777 fish and 1,799 invertebrate species 1. Together with all or part of the Philippines, Indonesia, Malaysia, Timor Leste and Papua New Guinea, the Solomon Islands is also part of the Coral Triangle, the global centre of marine diversity that comprises 76% of the world s corals and 37% of the world's coral reef fish species in an area that covers less than 2% of the planet s oceans. Choiseul -- also locally known as Lauru is one of the Solomon Islands nine provinces. It consists of Choiseul Island (3,106 km²), the two small islands of Wagina (82 km²) and Rob Roy (67 km²), and over 300 small islets, each less than 1 km². With peaks of up to 2,400m covered by tropical rainforest and surrounded by fringing coral reefs and lagoon systems, Choiseul has some of the highest coral and fish diversity of any of the provinces surveyed in the 2004 Solomon Islands Rapid Ecological Assessment 2 and contains some of the largest remaining stands of lowland rainforest in the Pacific. Its forests support a greater biodiversity than any other province in the Solomon archipelago. 3 Choiseul s local population of 31,259 (2005/6) is currently heavily dependent on natural resources for its survival, with an estimated 86-90% of the people conducting subsistence activities such as fishing and gardening. Due in part to its remoteness, earning opportunities are limited. Income is mostly generated through small scale copra production and harvesting of non-perishable marine products that can be processed and stored locally such as trochus, shark fin and sea cucumbers and through logging roylaties and small-scale logging with walkabout sawmills. The only major commercial activity at the moment is forestry. Choiseul Island is in fact the last major island in the country with significant remaining stands of lowland forest suitable for logging. With more than ten logging 1 Summary of species on the 2008 IUCN Red List of Threatened Species. 2 Green et al. (2006) 3 Mayr E. and Diamond J. (2001). 6 make connections with responsible buyers of small-scale timber shipments that match the communities capacity and criteria for sustainability. The Nature Conservancy, on the other hand, provided the appropriate level of technical assistance to conduct the plan. The relationship between TNC and the LLCTC, spanning more than ten years, had matured sufficiently to allow strong partnership based on trust and common interests. 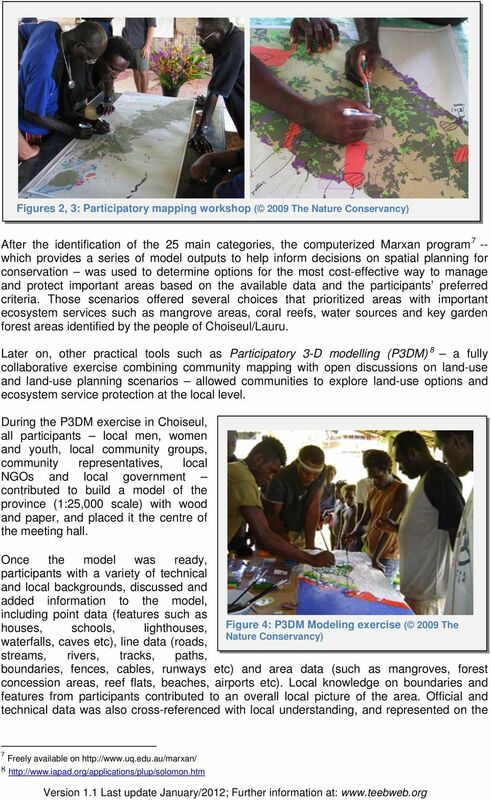 Online sources: Lauru Land Official Website Chivoko Participatory-3-Dimensional model References: Game E., Lipsett-Moore G., Hamilton R., Peterson N., Atu W., Kereseka J., Watts M. and Possingham H. (2011). 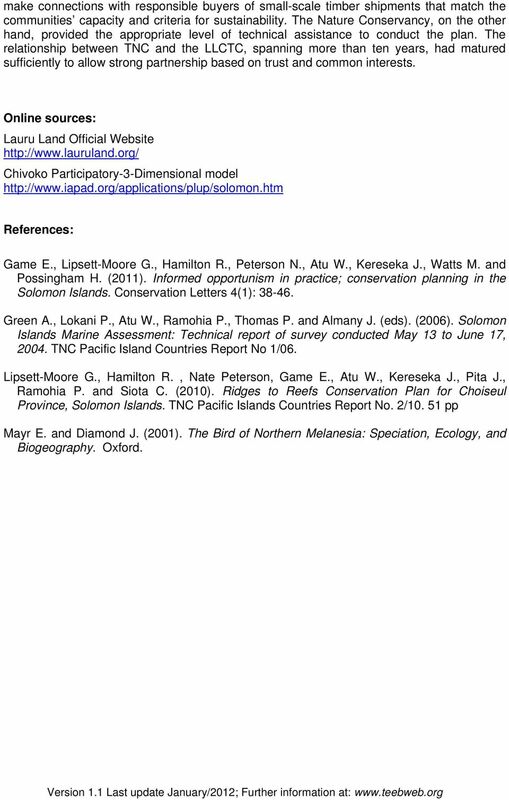 Informed opportunism in practice; conservation planning in the Solomon Islands. 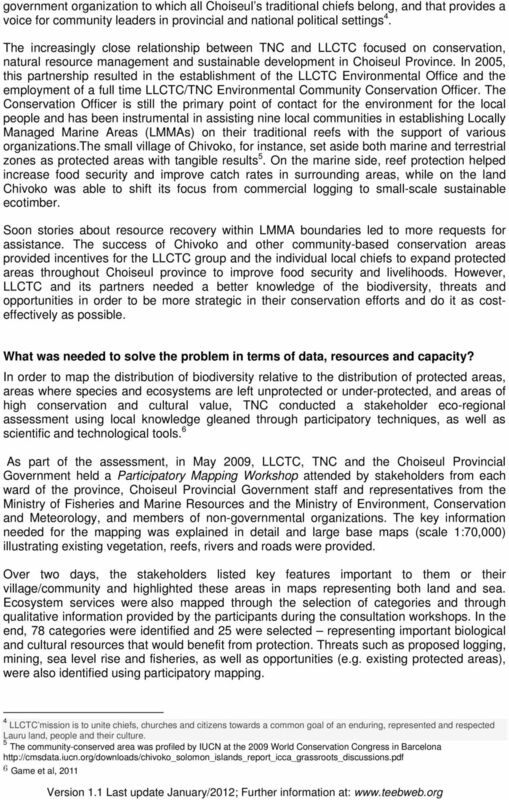 Conservation Letters 4(1): Green A., Lokani P., Atu W., Ramohia P., Thomas P. and Almany J. (eds). (2006). Solomon Islands Marine Assessment: Technical report of survey conducted May 13 to June 17, TNC Pacific Island Countries Report No 1/06. Lipsett-Moore G., Hamilton R., Nate Peterson, Game E., Atu W., Kereseka J., Pita J., Ramohia P. and Siota C. (2010). 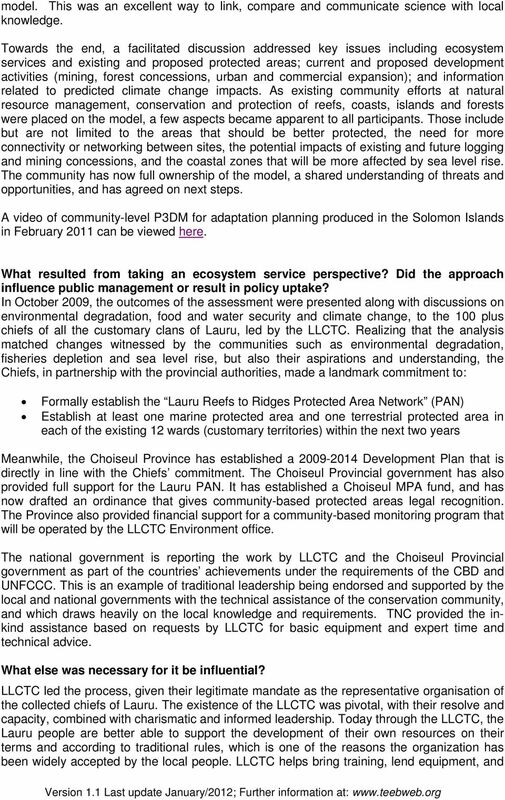 Ridges to Reefs Conservation Plan for Choiseul Province, Solomon Islands. TNC Pacific Islands Countries Report No. 2/ pp Mayr E. and Diamond J. (2001). The Bird of Northern Melanesia: Speciation, Ecology, and Biogeography. Oxford. Seaflower Biosphere Reserve Country: COLUMBIA Project Overview Columbia declared the archipelago of San Andres, Old Providence, and Santa Catalina a biosphere reserve called the Seaflower Biosphere Reserve.